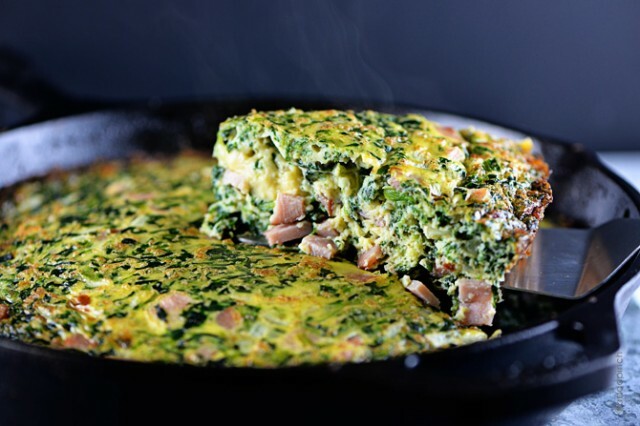 A frittata is an egg-based dish which includes other great additions like meat and vegetables. 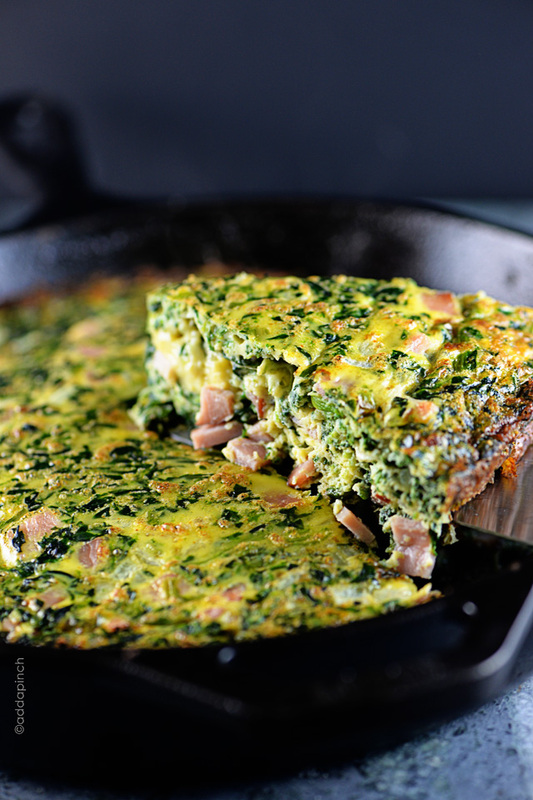 This frittata features delicious ham, spinach, onion, and spices to make it a one dish, yet memorable meal! A frittata makes one of our favorite simple recipes that we love as much for breakfast or brunch as we do for a light supper. So, when Smithfield asked me to use their Smithfield Signature Spiral Sliced Ham in a leftover makeover recipe, I knew just what I’d make! This frittata! So easy to pull together, a frittata makes an elegant dish to serve when entertaining guests for the weekend. 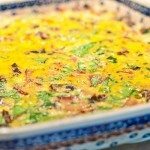 Knowing that Easter is just right around the corner followed by a season of showers, Mother’s Day, Father’s Day and so many other special occasions, I just knew this frittata recipe would be one you’d want to include in your arsenal of simple recipes! 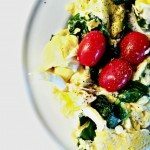 I love the ease of this frittata recipe in that you can quickly whip together your eggs and milk, toss in your leftover ham that you’ve diced, add in a package of spinach you’ve thawed and drained, and the stir in a few more items, pour it into a skillet, toss it into a preheated oven and in a few minutes you have a glorious meal that everyone will love! 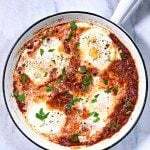 Packed with protein, it sure would be great to wake your family up to this for breakfast with a side of fresh fruit and juice to kick off their day in a wonderful way. 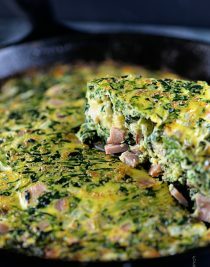 As amazing as this frittata is for breakfast, it would be just a fabulous served for a quick supper later in the week. 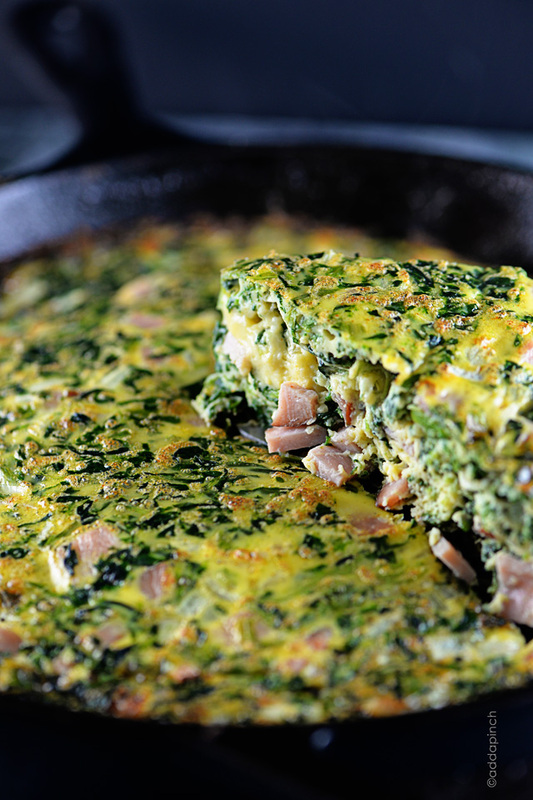 Here’s my fast, fabulous Ham Frittata recipe. I think you’ll love it! 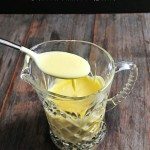 Whisk eggs and milk together in a large bowl until frothy. Add ham, spinach, onion, cheese, salt, dry mustard, and cayenne pepper. Whisk until well-combined. Melt butter in a 12-inch cast iron skillet or baking dish. 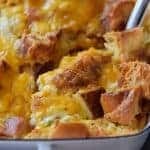 Pour frittata mixture into skillet and place into preheated oven for 10-12 minutes, until the frittata lightly browned and is set when the skillet is lightly jiggled. Remove from the oven and allow to sit for another 2-3 minutes to set completely before slicing and serving. Disclosure: I am thrilled to work with Smithfield in creating and sharing a recipe I think you’ll love for using your leftover ham! Robyn,can i use eggbeaters instead of the 8 eggs? Thanks Robyn for the nice recipe. Have a Fun Day! Holy cow does that look absolutely amazing!!! I am in love! I’m wondering about the time….only 10-12 minutes? I’m going on 30 minutes and it’s still not set in the middle. I’m sure it’ll be delicious but I just wanted to ask if maybe that was a typo? I see reference to garlic in the description but I don’t see any in the actual recipe. ?? ?